"The Genius" & "Brother Hate"
Until listening to a recent episode of the podcast Something To Wrestle with Bruce Prichard, I had forgotten about this gem. 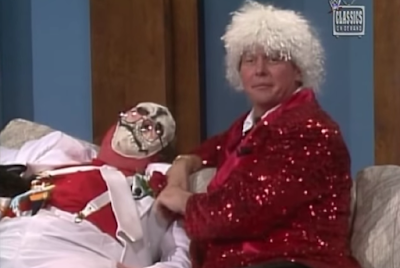 It's the Halloween episode of Prime Time Wrestling hosted by Gorilla Monsoon, Bobby "The Brain" Heenan and "Rowdy" Roddy Piper. Each host dressed in costume for the holiday and hilarity ensued. Heenan dressed as "The Genius" Lanny Poffo, Monsoon was Brother Hate but dressed like Brother Love and Piper did his best "Brain" impression. Heenan and Monsoon argue back and forth as their alter egos as Piper added some flamboyance to his portrayal of Heenan. At one point Heenan calls Piper's costume a "roughed up Phyliss Diller." The real Brother Love interrupts the show with a shouting tirade on Brother Hate, professing his love for all, including his benefactor "Million Dollar Man" Ted DiBiase. Piper returns to knock out Love with a small pumpkin, not quite as extreme as the coconut incident with "Superfly" Jimmy Snuka. But it was enough to render the Brother unconscious as Piper had a good time with him. Rewatching this clip makes me miss the good old days of WWF programming. I was in high school during this era and working a part-time job at the time so in all likelihood I recorded this show and watched it when I got home. The duo of Monsoon and Heenan may very well be the best in the history of wrestling. Add Piper's insanity and the antics of Brother Love and you've got the perfect storm for entertainment.